1- Where the tractor will work in your farm ? will you please kindly introduce us more about your local work conditions ? 2- Will you please kindly introduce us more about your company ? You are tractor distributors or just buy several sets to use by yourself ? 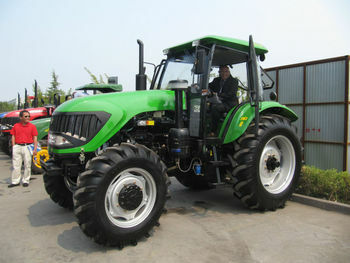 3- Have you ever imported any Chinese tractor ? If so, which brand you have buy ? a- The Tractor with Front Ballast, Rear Ballast or not ? b- The Tractor with Cabin or not ? If it has Cabin, it is luxury Cabin with A/C, CD etc. or General Cabin or Luxury Cabin without A/C ? c- If it has no Cabin, Is it need ROPs ? d- Do you need the Hydraulic output valve ? e- The PTO shaft is 6 Spline or 8 Spline ? f- It is the general lifter or strong take-up lifter ?